Sally Roberts had a rough start in life. So much so that a judge finally told her she had a choice between finding a productive after school activity and being sent to juvenile hall. 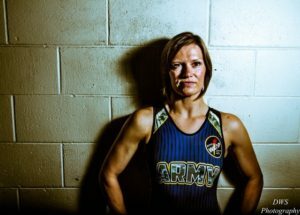 After trying (and failing) at several team sports she finally tried wrestling – and it changed the trajectory of her life. With hard work and grit Sally became a world class athlete. She was US National Champion, a two time world bronze medalist and secured a spot as alternate on the US Olympic team. Being an alternate was not enough for Sally so when she returned home from the Beijing Olympics she marched into the Army recruiter’s office and asked for the toughest job they could assign. Her aptitude tests were off the charts and she was placed in Special Forces Psychological Operations and volunteered to deploy to Afghanistan. While there, she was struck by the reaction of young Afghan girls when they saw a female soldier. It moved Sally so deeply that it planted the seed for her next move in life – affecting the lives of young girls in a positive way. Many of the concepts she teaches in her wrestling camps are applicable to all of us such as the concept of “WIN; What’s Important Now”. This sports psychology model teaches prioritization & focus upon the immediate issue at hand, whether that is winning a wrestling match or closing a business deal.